VHS tapes have a short shelf life – and once your tape breaks or wears out, it can be difficult (if not impossible) to retrieve the data. Convert your VHS tapes now with our VHS to DVD services and preserve those memories for years to come! LeMaster Graphics charges $30 per VHS tape. This includes the digital conversion of your tape and removal of beginning/ending static. It also includes one DVD copy with custom text printed directly on the disc face, in a clear plastic case. 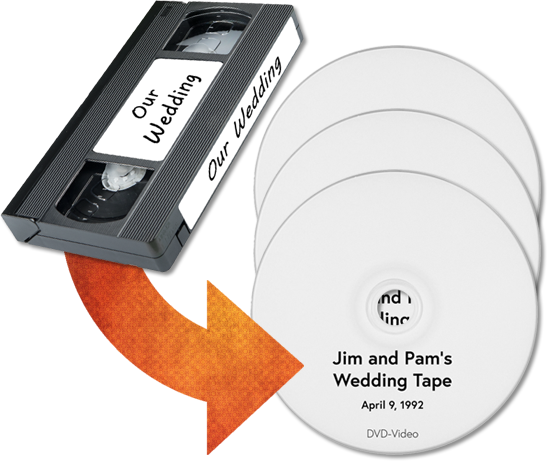 Click here to place your order for your VHS tape conversion. After ordering, please bring your tapes to our drop-off location at 1225 E Sunset Dr., Ste 145, Bellingham WA 98226. (Inside the Sunset Postal Business Center, to the left of Safeway). *Additional DVD copies of the same VHS are $10 each and also include your custom text on the disc face. A USB drive with video files of your VHS tapes may also be added for an additional $39 (maximum 15 videos per USB drive). Please contact us for a custom invoice if you would like additional DVD copies or a USB drive. Q: How long does it take to convert my tapes? A: Turnaround time is 3 business days for orders of 6 or fewer tapes. Q: Do you edit the tapes at all? Q: Do you watch the VHS tape content during VHS to DVD conversion? A: No – the beginning and ending few seconds will be seen during the editing process, but the tape content is not seen during the VHS to DVD conversion. Q: Can you tell me what’s on my tapes before I decide whether to pay for your services? A: No – the customer is responsible for knowing what’s on the tape. All VHS tapes submitted for conversion will be converted and must be paid for, regardless of length or content. Q: Can I get more than one DVD copy of the same tape? A: Yes – Additional DVDs may be added for $10 each. Q: Can you add a full-color label to my DVD? A: Yes – a high-resolution photo (minimum 1500 pixels wide) must be provided via email, or a physical photo (minimum 5″ wide) may be provided with the VHS copy. This photo will be printed on the disc label in full-color, along with your custom text. Please add $10 per disc for custom full-color photo labels. If you want to add custom full-color labels, please contact us for a custom invoice. Q: I have another question not listed here! A: Not a problem! Please contact us here or call 253-495-6351 and we’ll get you an answer ASAP.